The Morlaggan Rural Settlement Group believes it is important to enable people with no archaeological or academic experience to understand the history and archaeology of High Morlaggan and other similar deserted, ruined settlements. Interpreting the archaeological plans and the documentary research is vital to enable local communities to access their own doorstep heritage. Many individuals and organisations have helped our group in this interpretation process. Some of the ways in which the lost lives of the ‘shadow people’ of Morlaggan have been brought back to life are shown below. Many thanks go to all those people who have helped and participated in these events – especially the pupils and teachers of Arrochar Primary School. 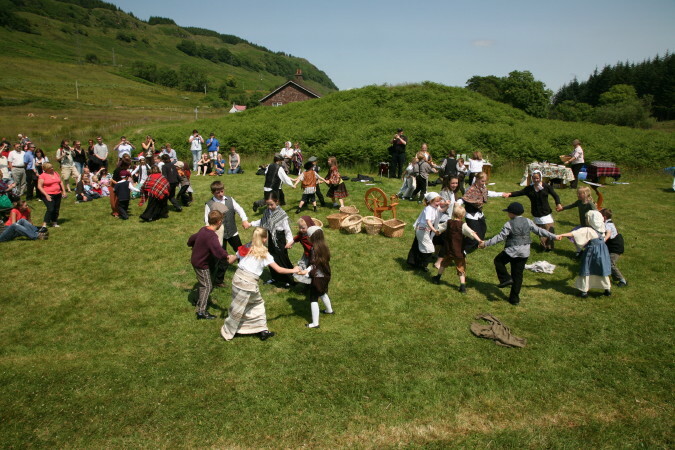 In late April 2009, a group of Gaelic singers were funded through Argyll and Bute’s Gaelic Programme to visit the school and introduce each class to life in the 1800s. Through story and song, the children learnt about their heritage and participated in traditional working songs. They sang while softening tweed, churning butter and grinding corn with a real quern stone. Brian Wilkinson, Education and Interpretation Officer from SRP, visited Arrochar Primary School in early May, 2009 for 2 days. He talked to all the pupils about archaeology and rural life in the early 1800s. The different classes used various methods to reconstruct the settlement, including: measuring the remains and using a computer program to create 3-D images of the cottages, based on real measurements; creating clay models of the cottages; listening to a story, written especially for the pupils; making a collage of the settlement in the 1800s; tasting lime cordial (a bottle of which was found at the site); meeting a descendent of a Morlaggan resident and learning about her family tree. Theatre Alba, a renowned Scottish theatre company, was funded by the Clore Duffield Performing Arts Foundation to work with the whole school to bring Scotland’s history alive. They used a creative drama process to engage and enhance the pupils’ understanding and appreciation of their heritage. They worked with the pupils over 4 days in June 2009, to create their own ‘story’ of life at Morlaggan. The children, along with Theatre Alba, performed ‘Stories from the Ruins’ at Auchindrain Museum near Inverary, at the end of the summer term, 2009. Funded by the Scottish Community Foundation, poet, Alistair Paterson, helped each class to write short poems about the lives of Morlaggan residents. 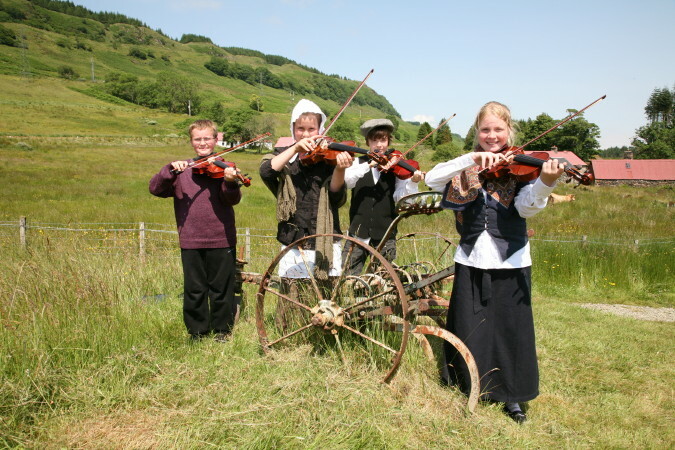 They too were performed at Auchindrain. 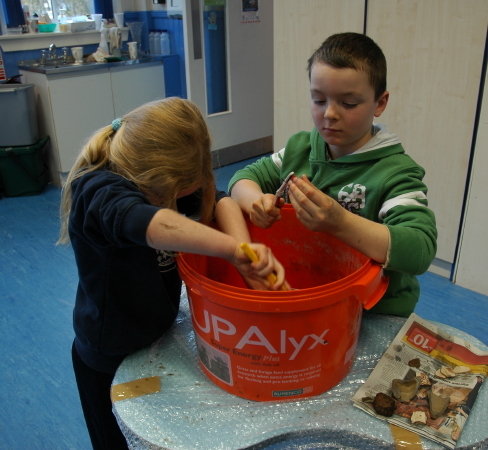 The children had great fun digging up bits of pottery during the excavations at Morlaggan. 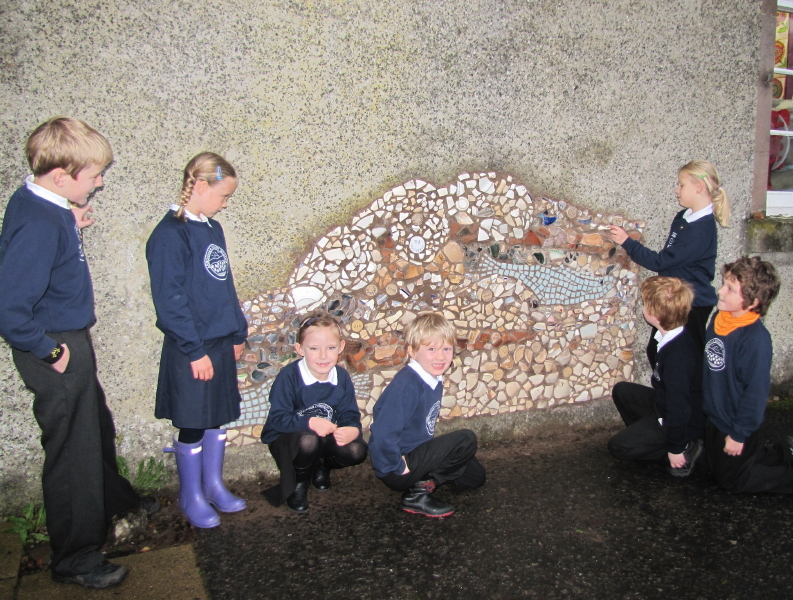 To make sure they had a permanent reminder of the project, at the same time as brightening up a dull wall in the playground, they made a mosaic using shards of pottery collected from the shores of Loch Lomond. Hands-on digging helps people to (literally) get in touch with their heritage. Nothing works better! Kilmartin House Museum used its expertise to ensure primary school pupils could dig and experience the thrill of post-excavation finds’ processing. Check out our ‘Excavation’ pages for more information. 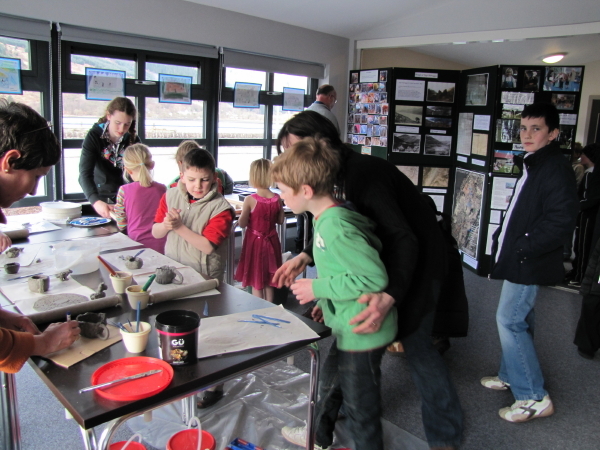 An exhibition was held in Arrochar’s Three Villages Hall, in March 2010, following phase 1 of the excavations in November 2009. 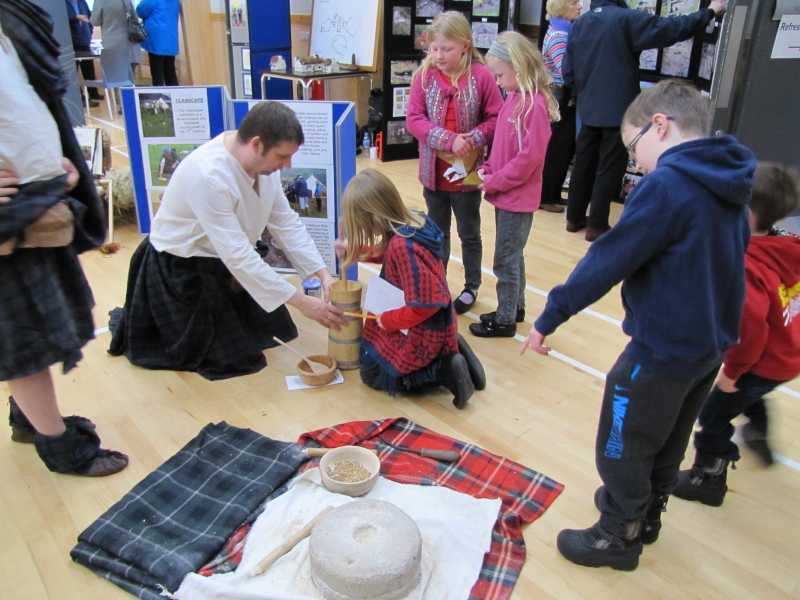 Over 200 people attended the day-long event, where the excavation and the history of High Morlaggan were interpreted to young people and adults, using a range of methods, including song, music, artefacts, clay modelling, mosaic-making, displays, lectures, paintings and poems. 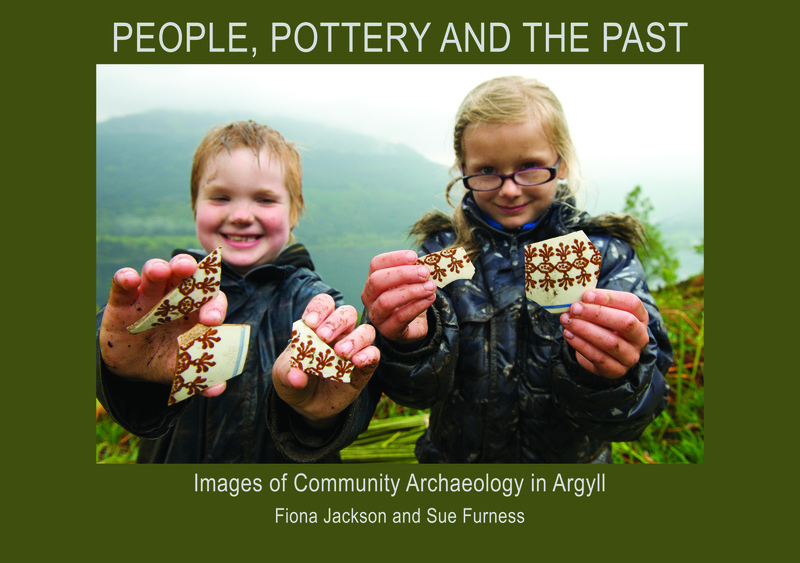 A second exhibition was held, also in the Three Villages Hall, in January 2012, to present the results of the second phase of the excavations in spring 2011, and to launch our book, ‘People, Pottery and the Past’. In the afternoon, a range of activities was on offer – many assisted by Loch Lomond and The Trossachs National Park Clanscape group – including willow weaving, clay-pipe making, sponge-decorating plates, and butter churning, while the school kids were invited to piece together their own giant pottery jigsaws! Site director Roddy Regan gave a short talk about the dig and the finds, especially targeted at the younger audience. Pottery and glass experts were on hand to answer questions about the finds from the dig, as well as to offer advice on any favourite pieces that visitors wanted to being along with them. Many of the artefacts found at the dig were on display, courtesy of Kilmartin House Museum, including some wonderful examples of pottery items painstakingly reconstructed by volunteers from the thousands of shards excavated! After a short musical introduction by Helen and Pippa Reid-Foster and some of the local school children, Sir Malcolm Colquhoun of Luss, the local landowner, opened the evening session by officially ‘launching’ the book, and introducing a more comprehensive lecture by Roddy. The talk helped to explain the results of the excavation to the many volunteers who came to listen, so many that we ran out of chairs, though fortunately, nobody seemed to mind! The evening was rounded off by those essential ingredients, food and music. 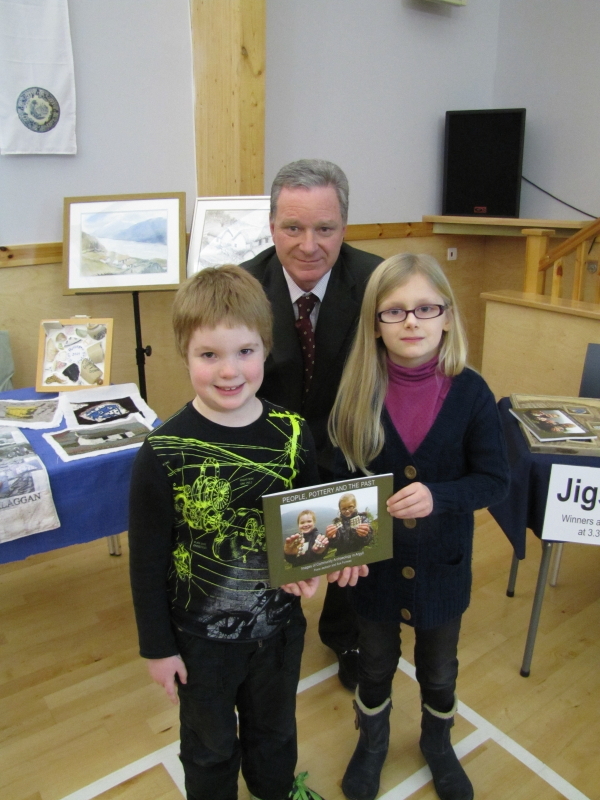 A local artist has interpreted High Morlaggan in her own way. The paintings will be available to view at any of our displays. The Morlaggan Rural Settlement Group has been asked to speak at a variety of local and national conferences. It has been a pleasure to share our findings with the wider public, and to gather new ideas from others who are also passionate about recording and interpreting their local heritage.